In Pursuit of Balance (IPOB) is intended to bring together like-minded winegrowers, winemakers, sommeliers, retailers, journalists and consumers who believe in the potential of California to produce profound, balanced Pinot Noirs and Chardonnays. In the words of the founders, Rajat Parr and Jasmine Hirsch, “This isn’t a rebellion, but rather a gathering of believers. The event is meant to open a dialogue between producers and consumers about the nature of balanced wine.” Listen to Jasmine Hirsch talk about IPOB in a recent interview I conducted before this event: http://www.princeofpinot.com/download/audio/IPOB_Jasmine%20Hirsch.mp3. The most recent In Pursuit of Balance event was held at Bluxome Street Winery in San Francisco on March 10, 2014. 400 people of the trade and media, including many well-known wine writers, sommeliers and winegrowers attended the morning seminars and early afternoon tastings, and over 450 consumers converged on the site for the early evening tastings provided by 31 wineries. The energy in the tasting venue was high and the quality of the wines were something to be thankful for. Video of the seminars is available for viewing at www.inpursuitofbalance.com. The participating wineries, all from California, included: Anthill Farms Winery, Bluxome Street Winery, Calera Wine Company, Ceritas, Chanin Wine Company, Cobb Wines, Copain Wines, Domaine de la Côte, Drew Family Cellars, Failla, Flowers Vineyard & Winery, Hanzell, Hirsch Vineyards, Knez Winery, Kutch Wines, LaRue Wines, LIOCO Wine Company, Liquid Farm, Littorai, Matthiasson, Mount Eden Vineyards, Native 9, The Ojai Vineyard, Peay Vineyards, Red Car Wine, Sandhi Wines, Soliste, Twomey, Tyler Winery, Varner, and Wind Gap. There is no clear, widely accepted objective definition of an old vine. Wikipedia states, “In a place where wine production is longstanding, it often means a wine whose vines are 30 to 40 years old.” Some winemakers consider these to be “mature” vines only, and insist that the term “old” vines be reserved for vines older than this. The term old vine is relative because in a newly established winegrowing region, 20 years might be considered old. 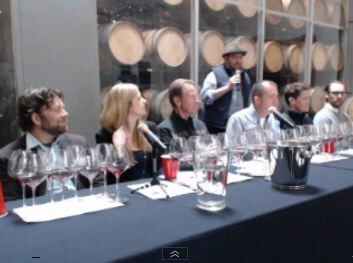 The panelists discussed whether vine age makes a difference in the quality of wines and how vine age effects viticultural and winemaking decisions. There are a number of widely accepted dictums regarding old Pinot Noir vines that I have gathered from previous seminars and the wine literature. I have added in opinions expressed in this seminar. * Vine age is difficult to taste in Pinot Noir as site often trumps vine age. * Old vine Pinot Noir seems to age better. * Old vines become infected with viruses, lower yields and causing the resulting wines to show less color. * Old vines generally produce grapes with physiological ripeness at lower Brix. New vine grapes ripen quicker, accumulate sugar faster, and generally have less acidity. * Old vine wines can be more layered, nuanced, complex, reserved, long on the palate, and more interesting. They are less overtly fruit, and more complete. Newer vine Pinot Noir tends to be more vibrant, expressive and exuberant with more grip and tannins. * Young vine wines can be like old vine wines if yields are tightly controlled. * New vine fruit is more consistent. * New vine yields are potentially higher. Younger vines are more exuberant and can “grow like crazy,” and can over crop if not regulated. Old vines are more steady and self-regulating. * Old vines have more haphazard growth with sometimes a hybrid mix of cordon and canes, requiring more work to farm, more individual attention, a more experienced crew, and can be more costly as a result. * The quality of old vine wines is also related to the fact that whoever planted the vines originally did the proper thing and the vines have survived. The vineyard is special as a result. * Young vines have the benefit of use of better rootstocks and clones, and more sophisticated viticulture technology. * The age of vines cannot be determined accurately unless the planting information is available. 2011 Wind Gap James Berry Vineyard Paso Robles Chardonnay Harvest Brix Vines planted in 1981. Harvest Brix 21.2º, 12.5% alc.. No new oak. More aromatic than Woodruff with floral and citrus notes most prominent. More body also, with crisp, more intense lemon-lime flavor. 2012 Wind Gap Woodruff Vineyard Santa Cruz Mountains Chardonnay Vines planted in 1978. Harvest Brix 22.7º, 13.5% alc.. No new oak. Delicate aromas of lemon, pineapple, wet stones. Acid-driven with citrusimbued minerality. The differences between the Wind Gap wines are probably more related to site differences. No definite conclusion about old versus young vines can be determined since the plantings of the two wines are only three years apart. That said, both wines are from older vines and were superb. 2011 Matthiasson Michael Mara Sonoma Coast Chardonnay 5-year-old vines. Aromas of pear, butterscotch and caramel. More fruity than the Linda Vista with less nuance. 2011 Matthiasson Linda Vista Napa Valley Chardonnay 20-year-old vines. Rich lemony aromas. More acid driven and austere with more minerality and a slightly tart finish. The older vines produced a wine that was more lean and mineral driven with less flamboyant fruit on the nose and palate. 2012 Ojai Bien Nacido Vineyard Santa Maria Valley Pinot Noir Vines planted in 2002. Very aromatic showing rose petal, candied cherry, herbs, oak and spice. Generous, long finish. 2012 Ojai Bien Nacido Vineyard Santa Maria Valley Pinot Noir Vines planted in 1973. Less primary fruit but more secondary characters. More complex, more grainy tannins and a longer finish. Overall, a more interesting wine. A big difference here, with the older vine Pinot Noir showing much less primary fruit aromas and flavors and more interesting secondary savory notes. The highlight of this seminar were the three wines presented by winemaker Michael McNeill of Hanzell. These were remarkable old, older and very old vine Pinot Noir that were marvelously fresh and nuanced. 2012 Hanzell de Brye Vineyard East Slope Sonoma Valley Pinot Noir Vines planted in 1999. Aromas of earthy cherry. Silky on the palate with crisp cherry and cranberry flavors. Still tight, but enjoyable. 2012 Hanzell de Brye Vineyard Sonoma Valley Pinot Noir Vines planted in 1976. Very Burgundian with many secondary aromas and flavors including herbs, tea, leather and earth. The red fruits are shy but pleasing and the finishing is amazingly long. 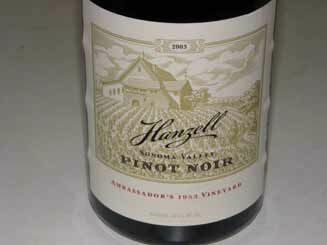 2012 Hanzell Ambassador’s 1953 Vineyard Sonoma Valley Pinot Noir The shy nose offers inviting raspberry and spice aromas. Delicious, fresh fruit core with plenty of vigor. Seamless with a gorgeous finish. * Level of ripeness is important for the wine’s ability to reflect the site (terroir). If too ripe, generally beyond 14.5% alcohol, terroir can be obscured or undiscovered. * There has been a trend over the past several years to pick riper fruit producing more alcoholic wines, particularly in warmer regions of the New World. In the past few years, there has been a swing back to picking at less ripeness. 24º to 25º Brix used to be the baseline for many, but many have now pulled back to 23º to 23.5º as a reasonable new baseline. * Ripeness is a complicated issue since it involves sugar, acid, and tannin as well as phenolics (flavor). * Determination of ripeness and when to pick is not a defined procedure and will vary from winemaker to winemaker. Some rely on sugar level, others acid level, and still others on flavor of the pips and seeds. Most seem to combine chemistry with flavor in making the decision to pick. For many winemakers today, the most desirable Brix level is often around 23.5º. * Winemakers like Josh Jensen believe it is better to error on the less ripe side, then to pick too late. * If grapes are picked too late, sugars are high, resultant alcohols are high, and alcohol reduction methods have to be used. Reducing the alcohol will lower the alcohol percentage, but not make the wine less ripe tasting. * If grapes lack acidity when picked, then tartaric acid is often added to bring the acid level up. Many people including Jamie Goode feel like the taste of added tartaric acid is not the same as natural acid. 2011 Tyler Sanford & Benedict Sta. Rita Hills Pinot Noir 13.4% alc.. Aromas of cherries and herbs with flavors that echo the nose. Mid weight core with mild tannins and bright acidity. 2011 Tyler Bien Nacido Vineyard Old Vines Santa Maria Valley Pinot Noir 13.6% alc.. A completely different wine with aromas of oak and herbs, and flavors of earthy, herbal dark cherry. This wine is displays riper and more robust fruit, more power. The differences between these two wines are primarily site-driven, and not related to significant ripeness or chemistry differences. Both vineyards planted in early 1970s, unrooted. 2013 Calera Mills Vineyard Lot A Mt. Harlan Pinot Noir Barrel sample. First batch Picked at 22.9º Brix, 12.9% alc.. Deeply colored. Leaner, tighter and more primary than Lot B. 2013 Calera Mills Vineyard Lot B Mt. Harlan Pinot Noir Barrel sample. Picked at 24.2º Brix 18 days later, 13.8% alc.. Riper tasting fruit, more generous, and appealing. The Calera wines presented by Josh Jensen gave the best insight into differences in wines picked at two stages of ripeness. The second wine was picked 18 days later than the first wine, and practically everyone in attendance preferred the second (Lot B) wine. Both wines from unrooted vines planted in 1984 with same exposure, same plant material (Calera field selection). The wines will spend one more year in barrel. 2012 LaRue Rice-Spivak Vineyard Sonoma Coast Pinot Noir Barrel sample. 13.2% alc.. Very soft in the mouth with a fruity finish. Definitely more plush fruit than the 2010 wine veering toward dark red cherry. 2010 LaRue Sonoma Coast Pinot Noir 100% Rice-Spivak Vineyard. 12.6% alc.. Redder fruits (cherry, especially strawberry) with an herbal streak. A very pretty, delicate wine. The winemaker prefers to pick when flavors between strawberry and cherry, but this decision will vary with the vintage. 2007 Copain Kiser En Bas Anderson Valley Pinot Noir 13.5% alc.. Definitely a riper, darker fruit profile, even prune and cooked notes. 2010 Copain Kiser En Bas Anderson Valley Pinot Noir 12.4% alc.. Red fruits with more vim and vigor and a pleasing finish. Much preferred over the riper 2007 wine. The tasting quickly became crowded with enthusiastic trade and media and I declined to elbow my way to every winery table. There were a number of wineries offering wines that I have previously reviewed so I did not pursue a revisit. Here are the wines that I was able to taste that were true to the ideal of balance and stood out for me. Most all these wines will be reviewed in detail in the PinotFile at some point this year.